Rubbermaid For Less is your single source for Rubbermaid Trash Cans including the popular Brute Containers, Untouchable Waste Receptacles, Slim Jim Trash Cans, Plaza Waste Bins and Glutton Containers. Rubbermaid also has a wide array of recycling trash cans that are the perfect solution for recycling aluminum cans, plastic bottles, newspaper, paper and more. Rubbermaid recycling containers exceed EPA guidelines for post-consumer recycled resin (PCR) content and assist in obtaining LEED Building Certification while helping manage waste and recycling streams more efficiently. Also, with Rubbermaid's acquisition of United Receptacle in June of 2007, Rubbermaid's product offering of decorative trash cans and smoking management accessories nearly tripled. United Receptacle most notably manufactures the popular Aspen, Americana, Architek, Avenue, Barclay, Howard Classics, Regent, Cornerstone, Keystone Series and Mesh Street Basket outdoor trash cans. United Receptacles indoor trash can line consists of the Silhouettes, Designer Line Half Rounds, Collect-A-Cubes, Crowne Collection, European, Metallic and Aluminum Designer Line, Eclipse, Accents, Stepmasters, Wastemasters and their ever so popular Defender Step On Medical Waste Cans. No matter what your need is for waste collection, our selection of Rubbermaid trash cans has you covered whether its indoors or out. 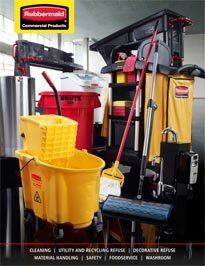 Browse our huge selection of Rubbermaid Trash Cans by clicking on any of the categories below.